in a frank, uncompromising manner." 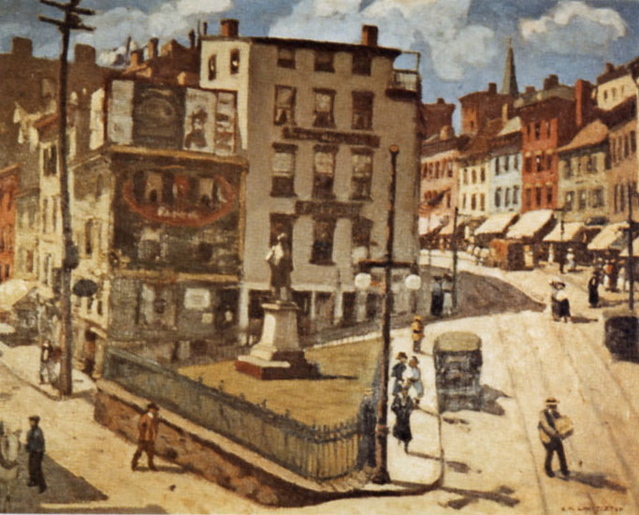 Clinton Square, c. 1917, oil on canvas, 24 x 30 in. Early in the summer of 1917, Chatterton rented a small office on the second floor of the Highland Bank building in downtown Newburgh. It was cramped and hot, but by sticking his head out of the window he had a good bird's-eye view in three directions. He spent the whole summer painting there and the three views became three large oil paintings -- Water Street, Saturday Shopping, and Clinton Square. In 1925, when he was 45 years old, Chatterton decided that a one-man show in a prestigious New York gallery was necessary for the advancement of his career. He approached the Wildenstein Gallery and, although they objected at first that they did not handle American artists, they finally agreed to give him an exhibition. Wildenstein had three galleries: two large ones connected by a small one. Chatterton's show was held in the small gallery, between a Toulouse Lautrec exhibition in one of the large galleries and a Fragonard show in the other. Evidently Chatterton's work, mostly paintings of his Newburgh period, did not suffer in the invitable comparison as critical comment was quite favorable. Although Clinton Square was not sold during the exhibition, the Wildenstein staff was so impressed that they included it in their Tri-National Exhibition, which they organized and sent to Europe and South America in 1926. Click here for the Water Street painting.